"Radio Free Europe" is a song by the American alternative rock band R.E.M. 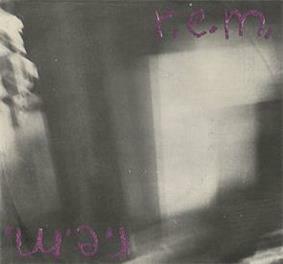 "Radio Free Europe" was released as R.E.M. 's debut single on the short-lived independent record label Hib-Tone in 1981. The song features "what were to become the trademark unintelligible lyrics which have distinguished R.E.M. 's work ever since." The single received critical acclaim, and its success earned the band a record deal with I.R.S. Records. R.E.M. re-recorded the song for its 1983 debut album Murmur and a live performance at Larry's Hideaway, Toronto, Canada, from July 9, 1983 was released on the 2008 Deluxe Edition reissue of that album. The re-recording for I.R.S. became the group's first charting single, peaking at number 78 on the Billboard Hot 100 chart. The song is ranked number 389 on Rolling Stone list of The 500 Greatest Songs of All Time. In 2010, it was added to the Library of Congress's National Recording Registry for setting "the pattern for later indie rock releases by breaking through on college radio in the face of mainstream radio's general indifference." R.E.M. formed in Michael Stipe had written for the song. By May 1981 the band added "Radio Free Europe" to its setlist. After a successful show opening for The Police, R.E.M. intended to record material for a demo tape. The group traveled to Drive-In Studios in Winston-Salem, North Carolina, to record some songs with producer Mitch Easter, who was a member of the band Let's Active. The band recorded "Radio Free Europe", "Sitting Still", and the instrumental song "White Tornado", which were placed on a promotional cassette tape. The band sent out 400 copies, one of which was received by Athens law student Jonny Hibbert. Hibbert offered to release "Radio Free Europe" and "Sitting Still" as a one-off 7" vinyl single with the understanding that he would own the publishing rights for both songs; the band agreed to his terms. However, Hibbert felt the recording was unsatisfactory, and oversaw a remix. Easter said he found the presence of Hibbert "distracting" and added, "He came into my studio and it was like, now the big city guy is going to do it right. We mixed the song for about 12 hours and really, there wasn't enough equipment to warrant more than 45 minutes." The final mastering of the song disappointed the band. Guitarist Peter Buck, who described the recording years later as "muddy and hi-end", expressed his displeasure by breaking a copy of the finished single and nailing to his wall. In contrast, Buck also admitted that "there's something to be said for the original sort of murky feeling for [the original recording]". The cover art to the single came courtesy of Michael Stipe. "Michael brought those negatives over to our place," explains photographer Terry Allen. "He said, 'Can you make a print of these?' and we said, 'What, you want a picture of this blur?' He said, 'Yeah,' and so I said, 'I've got a picture that's probably better than this that you can use,' but he said, 'No, I want this blur!'" Around 600 copies of the first pressing were sent out for promotional uses, but these omitted the Hib-Tone contact address. It was included, however, on the 6,000 copies of the second pressing. 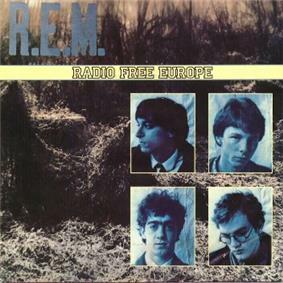 Sample of "Radio Free Europe", as recorded for R.E.M. 's debut album Murmur (1983). Rerecorded after its initial release as a single on Hib-Tone in 1981, the sample illustrates the change the verse to the pre-chorus. Guitarist Peter Buck and bassist Mike Mills play steady eight-note figures during the verse. During the prechorus, Buck switches to playing arpeggios. Both the Hib-Tone and I.R.S. releases of "Radio Free Europe" begin with brief instrumental intros before the band enters. The Hib-Tone version features a brief synthesizer figure. The intro to the I.R.S. version originated as an errant system hum accidentally recorded on tape. Easter triggered the effect to open and shut an electronic noise gate in time with bassist Mike Mills' playing. The producer then manually adjusted the EQ of the effect on the studio mixing console, and spliced the seven-bar figure into the start of the recording. Drummer Bill Berry begins the song with a four-to-the-floor beat, and then the rest of the band enters. Berry plays a steady backbeat throughout the song. During the verses, Mills plays a fast eighth note bassline pulse, characteristic of punk rock and new wave. Guitarist Peter Buck plays the palm-muted lower strings of his guitar, marking the end of a four-bar repetition with an upstroke strummed chord. During the prechorus refrain, Buck switches to playing arpeggios, ending each four bar phrase with a full chord downstroke. Mills accompanies this section by performing independent melody lines with syncopated rhythms. Mills' last note of the refrain is doubled by a piano. After two verses and two prechoruses, the band enters the song's chorus, where Stipe sings the phrase "Calling out in transit/Calling out in transit/Radio Free Europe". After a second chorus, a bridge section follows, where Mills' one-note ascending bassline is doubled by the piano. The band then plays a final verse-prechorus-chorus section. At the song's end, Buck plays an arpeggio figure similar to the prechorus refrain, and the band ends on an A chord. Stipe's lyrics are hard to discern, and largely serve to give the singer something to vocalize with. When first developing the original song, Stipe intentionally did not want the lyrics to be understood, as he "...hadn't written any of the words yet." Also, when the song was played live, Stipe improvised his own set of lyrics halfway through the song. In a 1988 NME interview, Stipe denied the interviewer's claim that his lyrics on Murmur were "indecipherable", but acknowledged that "Radio Free Europe" was one of the few exceptions, describing it as "complete babbling". (1983) "Talk About the Passion"
R.E.M. signed to I.R.S. Records in 1982. I.R.S. asked R.E.M. to re-record "Radio Free Europe" in 1983 for their debut album, Murmur. The band agreed, because they had felt that they'd improved significantly since the original 1981 sessions. The new version has some slightly different lyrics and a slower tempo, and is not as well-liked with the band as the original; indeed, the liner notes for the 1988 compilation album Eponymous (which the original Hib-Tone version is featured on) stated that "Mike and Jefferson think this one [referring to the Hib-Tone version] crushes the other one like a grape." Peter Buck has also stated that he "[didn't] think we captured it the way we did on the single." Original producer Mitch Easter also commented on the re-recording, saying it was "more pro, but a little too sedate." The re-recorded version of "Radio Free Europe" was the first single from Murmur. It was the first R.E.M. single to reach the charts, peaking at number 78 on the Billboard singles chart and remaining on the chart for five weeks. The song also reached number 25 on the Billboard Top Tracks chart. At the request of MTV, the single was accompanied by a music video, directed by Arthur Pierson. The video took place in the garden of artist Howard Finster, who would go on to paint the album cover for the band's second album, Reckoning. All songs written by Bill Berry, Peter Buck, Mike Mills, and Michael Stipe unless otherwise indicated. ^ Somerville, Colin (1999-07-11). "What's the Story, Michael?". The Scotsman. p. 5. ^ Donahue, Ann (2010-06-23). "Tupac, Willie Nelson, R.E.M. Among Inductees To National Recording Registry". ^ O'Hagan, Sean. "Another Green World". NME. December 24, 1988. ^ Pond, Steve. "In the Real World". Rolling Stone. December 3, 1987. Retrieved on May 19, 2008. ^ "Radio Free Europe". Rolling Stone. December 9, 2004. Retrieved on September 21, 2011. ^ R.E.M. - Charts & Awards - Billboard Singles. Allmusic.com. Retrieved on May 21, 2008.